New Delhi, 09 April 2019: India’s favourite food app, Zomato, recently published its Annual Report FY19 highlighting its performance over the last year and its ambitions to craft a future where everyone has easy access to fresh, clean and affordable food outside the home. One of the key drivers of this future is its food delivery business which grew from 15 cities to 213 cities in India within a year. Now that tier II, III and even tier V cities are ordering food online, what’s interesting to notice are the unique food ordering habits across India. An order worth a whopping ₹1,84,760 was delivered in 415 boxes in Jaipur, and another massive food order was placed by a user in Lucknow worth ₹16,800. Bhagalpur and Gaya have more delivery partners delivering food on cycles than on bikes. Over 100 Zomato delivery partners waiting to pick up their assignments at the Bawarchi restaurant in Hyderabad. Bawarchi typically receives ~2,000 orders a day from Zomato. 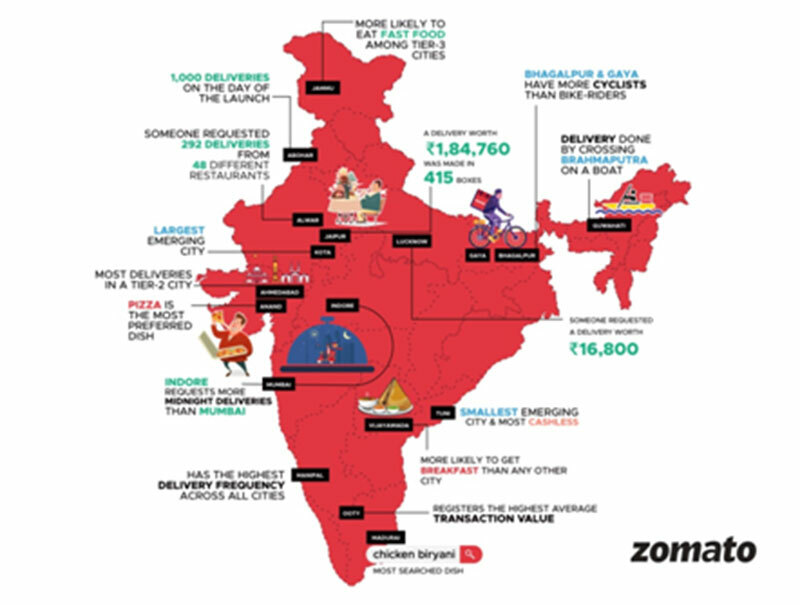 Zomato currently lists over 1 lakh restaurants in India and has a last mile delivery fleet of 180,000 partners. Globally, the food tech giant is present in over 10,000 cities with over 1.4 million active restaurants on the platform. Founded by Deepinder Goyal, Zomato is a restaurant reviews, restaurant discovery, food delivery and dining out transactions platform providing in-depth information for over 1.4 million restaurants across 24 countries and serves more than 65 million users every month.